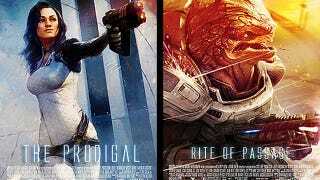 We keep hearing rumors here and there about a Mass Effect movie in the works. As much as I love the franchise, I'm not sure I ever really want to see one. My Shepard is, well, my Shepard, and any movie starring someone of that name is unlikely to tell the story I preferred having told. But with all that said, I would totally watch the hell out of movies based on these loyalty missions from Mass Effect 2. If they were real. Which they're not, and never will be. Probably just as well. Either way, these concept posters, from a Mass Effect fan on tumblr, are lovely. Maybe games should include them at the start of missions, the way a half-hour cartoon with three segments introduces each one. Scroll down or hit up the original link for the other four.